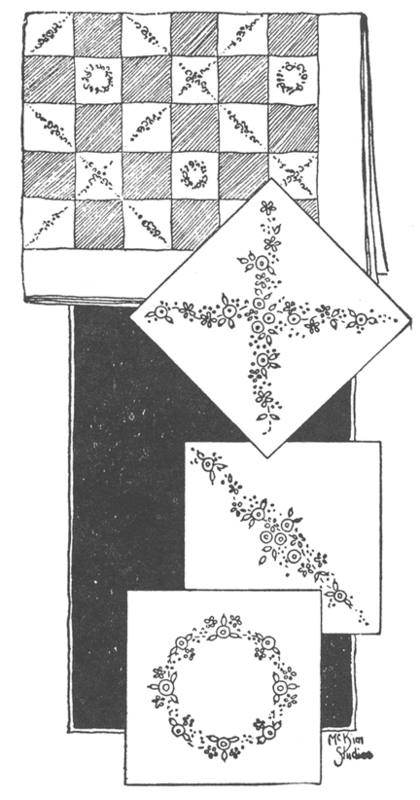 SEVENTY-ONE little embroidered squares set together in a definite plan, alternating with plain ones to make a pattern which crosses itself in diagonal lines of flowers, centering every large square with a flower wreath block, is suggested here in finest Buty-chine. Two color schemes are suggested—rose pink, orchid, sky blue and green being one favorite, while coral, apricot, yellow, turquoise and green is another. In the first instance alternate blocks may be pink, orchid or blue, while yellow or green is recommended with the second grouping. A set of 71 blocks, the correct number of each design, stamped on ivory white buty-chine is order No. 361M at $2.50. 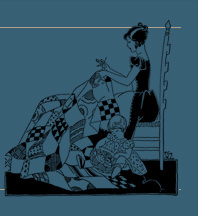 For 72 alternate color blocks all cut exactly 6 inches square of matching buty-chine in any tint order No. 361B at $2.00. An assortment of embroidery threads is 361T-1 or 361T-2 for the first or second color scheme as given above, 17 skeins for 50 cents. Or a perforated pattern of the three blocks which you may use numerous times on your own materials is 361P at only 40 cents. The quilt center pieces 66x78 less seams, so you may want a border, for which we can supply any amount of buty-chine at the rate of 60 cents per yard.